​My last marathon was the 118th Boston Marathon in 2014 where I ran my current PR of 2:49:52. That was an emotional race for me because my mentor and close friend, Sonny Hyman, passed away five days before. Running a sub 2:50 at Boston with his name written on my right arm in marker, wearing his favorite color neon green, and hearing the crowds chant "Sonny" for him was one of the most special moments in my running career. I was overcome with emotion at that finish for Sonny because he was with me. After that I was satisfied for awhile in the marathon. I continued to race other distances in 2014. In fact, I did 13 races in 2014 with one in every month for the first time in my life; I raced twice in October. 2014 was a great running year for me culminating with FIVE new personal records; half marathon, marathon, road mile, 10 miles, and 4 miles! However, doing that took it's toll on me as I was not the same in 2015. I started having some upper right hamstring/pirformis/hip tightness that I couldn't shake even with rest and foam rolling. I kept racing in 2015 until after the Beaufort Road Race when I knew I had to get aggressive with my injury. I took a break from running and sought Physical Therapy from my friend Katherine Price, owner of The Body Shoppe Physical Therapy. I also started getting regular massages from another friend, Holly Fisher. I skipped one of my favorite races that October, the Twin Bridges 8K Road Race. Previously I had only missed that race once since I started doing it in 2000. I regret skipping it in 2015 even though I was hurting. I could have ran it easy and for enjoyment but I knew it would be hard to do that in a race; especially one I won in 2013 and one that was also Sonny's favorite area race. Thanks to the physical therapy exercises and regular massage therapy I was gradually able to start running again with the pain getting less and less. My first race back on little training and no speed work was the Beaufort Resolution Run 5K on January 1, 2016; which I won in 18:20. It was a good starting point for the new year. I continued to get stronger and was able to start seriously training again by adding in tempo runs and intervals. I still wasn't in PR shape for the races I was running but it felt good to race again pain free. ​​I went with Katherine, her husband Jamie, and their son Brock to the 120th Boston Marathon earlier this year. I thought it would be hard to spectate the Boston Marathon instead of running it but I had a blast! It was a fun trip. I ended up getting to run on the Charles River greenway and the day after the Marathon I ran from our hotel out to Newton and ran the famed Newton Hills. You know what, they're really not bad when they don't come at miles 18-22. There is nothing like spectating a marathon, especially Boston, to make you miss running marathons and get you excited to do another one. One of my best friends, Jarrod, and I started talking about a Fall/Winter 2016 marathon. Jarrod is trying to qualify for Boston in every state before he dies. We've been training together for years since we met but have only done three marathons together. I knew I wanted my first marathon back to be with a friend. He hadn't done the state of Arkansas yet and he found the 3 Bridges Marathon online. I was still hesitant about doing it because I wasn't sure how my body would handle marathon training again. The race had great reviews on Marathon Guide and based on previous results Jarrod and I had a shot at going 1-2. I thought that would be so cool! I've always wanted to win a marathon because it is one of the few distances I've raced that I hadn't won. Jarrod got his marathon win at the Brookings Marathon in South Dakota in 2011. We settled on the 3 Bridges Marathon on December 17th as our race. I started training August 1st with Philip Latter of The Running Syndicate as my Coach. I had done well on training plans form the book Advanced Marathoning in the past but I wanted my own personal plan and Philip was the guy I trusted based on his success as runner and multiple High School Cross-Country State Championship winning Coach. My training was going well and I was enjoying the custom training plan. It's good to mix up workouts so your body doesn't get used to the same training plan over and over. Philip progressed me along nicely as we didn't want to re-aggravate my injury. While I was feeling stronger and faster Jarrod started having some knee pain and had to scale back on his training. Unfortunately, Jarrod made the decision not to run the 3 Bridges Marathon because of his knee. Marathon training is hard enough when you're healthy but it's impossible when you're hurt. He still continued to join me for parts of my long runs and I appreciated his company. ​​I continued on with my training being coached by Philip and I was getting back to my previous race shape before the injury. I was coming off back to back 70 mile weeks when I ran the Battleship Half Marathon in Wilmington on November 6th. On Saturday, eight days before, I ran my longest long run of the training cycle; 23 miles at 7:26 min/pace. I followed that up the day after with another 10 miles on hills in William B. Umstead State Park at 7:14 min/mile pace. I wasn't completely fresh for the Battleship Half but the Half was not the goal race, the marathon was. I ran a 1:20:36 half to finish 6th overall. I was happy with the time as it was my fastest since my PR of 1:19:33 at the 2014 Crystal Coast Half Marathon. It was also 30 seconds faster than I ran the 2016 edition of the Crystal Coast Half Marathon. The Battleship Half Marathon gave me a big boost of confidence for the rest of my marathon training cycle. I kept surprising myself by nailing the workouts Philip was giving me. As race day got closer he thought I had a shot at a sub 2:50. I wasn't so sure at first but he kept telling me I was ready and I believed him. I was also feeling nervous as race day got closer because I hadn't done a marathon in 32 months. Sonny always said "if you're not nervous before a race your heart isn't beating". No matter how well prepared you are you should still be a little nervous before a race, especially a marathon. A lot can happen in 26.2 miles. I've had a lot of help, support, and encouragement from my friends, training partners, family, and my coach Philip to get me ready for my first marathon in over 2.5 years. I really appreciate all of it and I can't thank y'all enough. Now I just have to run the race, represent The Running Syndicate well, and make y'all all proud. I have been considering hiring a personal running coach for about a year. I have done well on training plans out of books in the past but wanted something new to get faster. If you keep training the same way over and over you'll get the same results. I believe you got to mix up your training and challenge the body in different ways to improve the most. I ran my first marathon, a 3:00:21 at the Shamrock Marathon in Virginia Beach in 2009, on a plan I made myself along with pieces from my training partner Jarrod's plan has he had ran marathons already. For my second marathon, a 2:55:10 at the Tobacco Road Marathon in Cary, NC in 2010, I trained with my friend Pat Price as he was training for Boston and did a lot of the same training he did. I kept taking pieces from friends and adding it to what I thought worked in the past for me. I eventually got the book Advanced Marathoning from my friend Greg and used the 18 week, 55-70 miles a week plan for the 2012 Boston Marathon. Although I felt I was in the best marathon shape I had ever been in, the record heat that year in Boston ruined a shot at a PR although I did PR in the half and 10K while in marathon training. I used Advanced Marathoning and Pete Pfitzinger plans for my next three marathons. For the 2014 Boston Marathon I did another Pfitzinger plan while making modifications to it from workouts I got from a friend that is trained by Zap Fitness Coaching. I liked the new workouts and mix up and it helped me PR for a third time at Boston with my first sub 2:50, running 2:49:52. The plans in Advanced Marathoning stress tempos and goal marathon pace miles which I am a big believer in. You can't expect to run a certain pace on race day if you haven't ran at that pace a lot in training. I also liked the fast finish long runs such as 18 miles with the final 8-10 at goal marathon pace. Doing all your long runs at an easy pace won't benefit you come race day if you have a time goal. I loved the book and I highly recommend it! This year I began seriously considering a personal coach to take my running to a higher level. I was already leaning towards one company when I got the book Faster Road Racing, by Pete Pfitzinger and Philip Latter. Unlike Advanced Marathoning, Faster Road Racing focuses on 5K - Half Marathon training. Along with having plans for 5K, 8k and 10K, 15K and 10 Miles, and the Half Marathon, the book has chapters on base training, Masters Running, dynamic warm-up, core workouts, and running nutrition. I used a half marathon plan for the 2014 Crystal Coast Half Marathon and won with a time of 1:21:47. It wasn't my fastest time but it was in very windy conditions and I was all by myself with no one to push me as I won by almost five minutes. I followed it up with a 10K two weeks later in 36:49, close to my road PR. I think that is a great book and highly recommend it for anyone training for 5Ks to half marathons. I did some research online about Philip Latter because I did not know him but a couple friends did. I found his website, The Running Syndicate. Philip Latter and Peyton Hoyal do online coaching on their website. I read about each of their backgrounds and was very interested. Both coaches are very talented runners in their own rights with some impressive PRs and accomplishments. Latter has been a successful college and high school coach winning multiple state championships. I decided to email Philip Latter and get more information about online coaching and the price. After exchanging emails and a phone call I was convinced Philip Latter was the coach I wanted. I agreed with his training philosophy and his price per month was cheaper than the other company I was considering. I started working with Philip Latter on June 1st. It has been going well so far although we are still base training with the bigger picture of a fall marathon as the goal. I want to lower my PR from 2:49 to anything under it but would like to get close to 2:45. I want to get faster across the board and I believe Philip Latter and online coaching will get me there. Hiring a professional to tailor my workouts just for me will help me train smarter and get fitter than I would training by myself or following plans out of books with modifications from friends like I've done in the past. Working with a coach may seem like a privilege reserved for professional runners and an extravagance for the "normal person" but non-professional runners can benefit even more from the attention, knowledge, and guidance of a coach. I am enjoying not having to plan my training: I can turn off my brain and just let my legs do the work. There are a lot of things to consider when hiring a coach. Obviously cost is a factor. Personal coaching can range from $60 to $200 a month depending who you cho0se. If you're willing to put in the work, effort, and are dedicated and determined enough to train very hard it is worth the cost to have the guidance of a more experience coach. It's an investment in yourself and your training if you are serious about improving as a runner. The right coach is willing to push you when you need it and wise enough to rein you in when appropriate. A personal coach is going to analyze your past training and current goals and find what the missing pieces are and make a custom plan for you that no one else will have. An online coach is going to work around your schedule and make adjustments as life events come up. That's something a plan out of a book will not do. If you start feeling tired, sick, or injured a coach can help determine what will do you harm and what you can handle. If you are considering hiring a personal coach, I highly recommend The Running Syndicate. There are a lot of options out there for personal coaching so do your research. 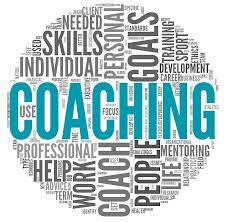 Interview several coaches and ask them what their training philosophy is, how many runners like yourself have they worked with, how much experience do they have, and what amount of communication and extras aside from a plan are you getting for the cost of personal coaching services. Finding a good coach can help you reach goals you previously didn't think you could accomplish. It is fairly simple to dress for running in warm weather. If you’re a guy you may only need socks, shoes, and shorts and girls may be comfortable in shorts, socks, shoes, and a sports bra or sports bar and singlet. Running in the winter requires more time planning the appropriate outfit to fit the cold and possible rain, sleet, and snow. There is a lot of winter running gear on the market and at your local running specialty store. I’m going to write about my favorite gear in the hopes that my reviews and suggestions will help you with your winter running gear purchases. Winter running gear is all about layering. Layering provides the best interaction with your body regardless of your performance level. Thanks to different layers combined with modern fabric technology, your body’s microclimate is always maintained at a comfortable level and the different layers interact with your natural thermo regulation at different activity levels in different weather conditions. There are three levels of layering to ensure you ultimate protection; the base layer, the mid layer, and the outer layer. The base layer, or first layer, is the moisture management layer. It provides initial heat loss regulation and promotes the transfer of moisture away from the skin. Depending on the temperature and wind chill you can get by with a technical fabric underwear as your base layer. For a base layer top I go with a short or long sleeve tech shirt depending on the wind chill. I will wear a short sleeve shirt with my second top over that if temperature and wind chill are in the 30s. Some of my favorite base layer shirts are the Adidas Supernova short sleeve, Adidas Response short sleeve, and a short sleeve heat gear Under Armour shirt. I use long sleeve base layer tops when the wind chill is in the 20s or under and if I’m running easy because I won’t warm up as much as I do when running a workout or long run. My favorite long sleeve base layer tops are my Capital RunWalk Brooks long sleeve tech tops and the Under Armour ColdGear mock. The main thing to look for in a base layer top or bottom is the fabric material. You want 100% polyester or polyester and spandex, no cotton. In fact you don’t want or need cotton as any layer. The second layer is the mid layer. The mid layer is thermo regulation. It is used to trap air, keeping you warm in the cold and cool when it’s hot. If it’s in the 40s I usually wear shorts but a running tight that isn’t too thick or warm would work too. In the 30s and colder I wear my go-to cold weather tights, the Adidas ClimaHeat brushed long tights. I’ve ran in them with just a base layer under in a wind chill as low as 5 and stayed warm from the waist down. I haven’t found a warmer tight yet. The ClimaHeat brushed material performs well in the cold and wind. The last layer, the outer layer is weather protection. This layer protects your mid and base layers from rain, snow, and wind. In this category you want to look for a jacket or half zip top that will protect against the weather. If it isn’t windy, raining, or snowing I go with the Brooks Nightlife half zip long sleeve, the Adidas Sequencials Climalite half zip long sleeve tee, or my Capital RunWalk Brooks Nightlife jacket. Although the Brooks Nightlife jacket is water resistant it only works well in a mist or light rain on a short run. I wouldn’t recommend it for a long run even in a light rain. It does keep you very warm in wind even if it’s not raining. My girlfriend has the same jacket and it performs well with just a singlet under it with the temperature in the 30s. My go to jacket for wind, cold, and rain is the Mythos 2.0 Gore-Tex Active Jacket. It is fully waterproof, windproof, and breathable. It is expensive at $259.99 but worth it. My first two runs in the jacket were cold and windy with a wind chill of 5 and 12 degrees and I just had a long sleeve base layer top under it and I stayed warm. My third run in the jacket was 40 degrees and dropping in a steady rain and I stayed dry minus sweat. The jacket performed awesome in the cold, wind, and rain. Gore-Tex is the go-to brand for wind and rain gear. I opted for the Mythos jacket because I wanted two front zip pockets. Another great jacket by them that is a little cheaper at $229.99-$239.99 is the Air Gore-Tex Active Jacket. It is fully wind and waterproof but doesn’t have the two front zip pockets but does have a zip pocket on the left chest. Both jackets have a lot of reflective material for visibility in low light conditions. You can never be too reflective and too visible. Now on to the feet, hands, face, and head. For cold weather socks I prefer the SmartWool PhD Run Light Elite. The smart wool is warm and I like the higher sock height of the low cut and mini as opposed to the hidden (no-show) and micro cuts because they cover the skin left exposed when my tights slide up over my ankle when running. SmartWool socks are also more durable than other brands I’ve used. Other great cold weather socks are the Balega Merino Endure quarter socks and Balega Mohrino V-Tech Eduro socks. On days it is below 20 degrees I will put on a thinner pair of socks, like the Feetures high performance light cushion or Fitsok CF2 cushion, with the SmartWool socks on top. Yes, two pairs of socks for really cold runs! For the hands I prefer mittens over gloves in the cold, and not the gloves that can be converted to mittens by a flap over the fingers. Those are not the same as true mittens. Mittens keep your hands warmer than gloves. My favorite mittens are the Saucony mittens Jamie got me. They have worked great even with a wind chill of 5 degrees with no liner glove on under them. Unfortunately, the only ones listed online are gloves that have a flat to convert to mittens. When shopping, look for regular running mittens. My hands get warm in those in the upper 30s-45 degrees so I don’t wear my mittens for those runs. Instead, I wear my Nathan Bronco gloves. They work well when it’s too warm for mittens but not warm enough to go without something on your hands. They are super reflective and have a small key pocket that can be used to clip a small Nathan light onto. I used to wear the Under Armour cold gear extreme gloves but they were a disappointment as my hands stayed cold even in the upper 30s. I don’t recommend those. I only cover my face on really cold days where the wind chill is in the 20s and under. For that I use the Under Armour cold gear infrared tactical hood and it does perform well. It covers your ears and full face with the ability to pull the front up or down over your mouth and nose if needed. I’ll also put on a beanie over it to trap heat. If it’s in the upper 30s or above I don’t wear the hood and just opt for my Indianapolis Monumental Marathon beanie or a running hat. My North Face Trail Stormy hat is great and fully waterproof. It keeps my head dry and warm in raining cold runs. My Ice Grips work great! We’ve gotten more snow and ice the last couple years in North Carolina than we are accustomed to so we’ve had to deal with ice on our roads, trails, and greenways. Last year my friend Jarrod, from Minnesota, recommended I get ice grips. He uses the DueNorth Traction aids that easily slide on any running shoe. They are similar to Yaktrax but cheaper. I got a pair and they have been very useful. I’ve be able to run 14 miles over snow and ice with the ice grips on without slipping or falling once. 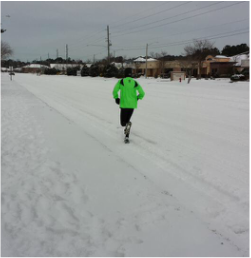 It also helps to run on snow with grass or dirt under it instead of slick pavement if you can. I have friends with the Yaktrax Run grips and they work great too. You still need to be careful around turns and it’s always best to slow down on turns but they will give you plenty of traction to be able to run outside during sleet, ice, and snow. Granted, it’s hard to get in a tempo or intervals wearing ice grips but they have worked well for me on easy and long runs. My outfit with a wind chill of 5 degrees: base layer underwear, Adidas supernova short tight, 2XU Compression Performance Run socks, Smart wool PhD run socks, Adidas Climaheat long tight, Under Armour cold gear long sleeve mock, Mythos 2.0 Gore-Tex jacket, Under Armour cold gear infrared tactical hood, beanie, and Saucony mittens. There you have it, my head to toe favorite winter running gear. My go to brand is Gore Running Wear. They may be more expensive than other brands but they work and perform at the highest level in the cold, wind, and rain. They have all three layers covered for a complete outfit. There are other solid options as well which I mentioned in this post. I hope it helps you plan your next winter running outfit. Just remember, never go with cotton. Always go with technical fabrics to keep you dry and warm. I’ll always chose 30s and under over heat and humidity for running any day. Enjoy your winter running! The inaugural Sir Walter Miler was held on August 1, 2014 at the Meredith College Track in Raleigh, NC. The event was organized by Pat Price, Logan Roberts, and Sandy Roberts. They put together two elite fields for the Capital RunWalk Men's Sub 4 Challenge and the Capital RunWalk Women's Sub 4.5 challenge. The Kickstarter campaign raised $3,502 which was more than their goal. That was used as prize money for the elite runners. I was fortunate to be invited to have dinner with the Pros at the Busy Bee Cafe the night before racing. The dinner was great and the food was delicious. I got the grilled salmon and it was wonderful. I sat at the table with Ford Palmer and Lucas Manring along with local Raleigh Runners David Meeker and his wife Kimberlie Fowler Meeker. It was a lot of fun talking to Ford and Lucas. I was impressed with their running performances. They were humble, not cocky or coincided, and easy to talk to. We even enjoyed talking about the Tour De France and Ford showed us his awesome King of the Mountain Hats he brought with him. It was a lot of fun getting to socialize with the elite runners. It rained most of the day in Raleigh but was starting to lighten up and remained overcast when racing started on Friday, August 1st at 9:15 pm with the Raleigh's Finest Mile. Running wise, you couldn't ask for better weather in August in North Carolina. The temperature was in the mid to upper 60s, overcast, light breeze, and a light misting rain at times. The staff did a great job drying the track and getting a lot of water off it. Despite the weather, about 1,000 spectators showed up to watch and cheer. They were allowed onto the track as long as they stayed out of the first four lanes. This made for an even better event as the crowd got to create a scream tunnel on the front stretch for the runners to go through and feed off of. The elite women took to the track at 9:30pm for their race under the lights. Stephanie Garcia, member of the Furman Elite team paced her teammate Heidi Gregson and the rest of the women's field for the fist 1200m before pulling off. Stephanie and Heidi were all alone up front as they ran away from the field. Garcia has the second fastest Womens 3000 meter steeplechase (9:24.28) in the United States this year. Gergson won the Capital RunWalk Women's sub 4.5 Challenge in 4:34.05, the fastest time in North Carolina History. In a close battle for second place, Kristen Findley of Austin, Texas (4:42.45) narrowly held off former Duke star, Cydney Ross (4:42.78), to round out the top three. You can watch the race on YouTube. The men were up next up at 9:40pm. The men's field was paced by Raleigh's own Bobby Mack. Bobby paced the field through the first 800m in 1:58. As they were coming down the front stretch to finish the first 800m, Ford Palmer took the lead. He was looking strong but they all were and it was a tight group leading the race. Ford led almost all of lap three before being passed at the start/finish line. Ford stayed controlled and re-took the lead with 300m to go and started pulling away with 200m to go. Ford was flying down the home stretch as he took the win in 3:57.61. Ford was due for sub 4. He had run under 4:01 four times, including a 4:00.00, but hadn't broken 4 minutes until this race. Donnie Cowart of Winston-Salem, NC placed 2nd in 3:58.43 and Isaac Presson of Asheville, NC finished 3rd in 3:59.77. It was the first time under four for Cowart and the second for Presson. Donnie had a stomach leading up to the race but still managed to run his first sub 4 mile. He wrote a recap you can read on Bring Back The Mile. You can watch the race on YouTube. It was awesome to see a sub 4 mile in person and to see three guys go under it. The local crowd and myself wanted Sandy Roberts to run sub 4 but it didn't happen this year. Sandy was the reason for the Sandman Mile last year where he ran the last two laps solo after his brother Logan paced him through the first 800m in 1:59. Sandy is a great guy and class act and he's gonna get sub 4 on the track. The Sir Walter Miler events concluded with a Run With The Pros the following morning at William B. Umstead State Park. It was an easy run down the single track Loblolly trail to Reedy Creek and up Reedy Creek Lake to finish. We had some on and off rain but it was another fun way to socialize with the elite runners before they headed home. Pat, Logan, and Sandy put on a first class event. I think they have a great template to make the Sir Walter Miler a great event for years to come. All their hard work paid off and was much appreciated by the fans and runners. Kudos to the the race directors! Last year Jamie and I went to watch the Sandman Mile held at the Cardinal Gibbons Track in Raleigh. The event started as a local runner and Capital RunWalk teammate Sandy Roberts wanted to break 4:00 in the mile. My friend Pat Price organized the event and in only a few short days promoted it, secured a location and timer. Over 400 people showed up to cheer Sandy and his brother Logan on. Logan paced Sandy through the first 800m in 1:59 but Sandy came up just short finishing in 4:06 after running the last two laps solo. The crowd support was great and it was a fun event. It was the fastest mile I have seen in person. Well, Pat Price is at it again this year with a bigger and better event planned. He announced the Sir Walter Miler yesterday. The event will be held August 1 at 9pm at the Meredith College Track. On the day of the race, there will be a pre and post-race party at Raleigh Brewing Company (across the street from Meredith College). Starting at 7pm that night, there will be live music, giveaways, and multiple food trucks. If you’re over 21 years old, you can take part in an exciting event at RBC called the “Sub 4 ABV Challenge” where Raleigh Brewing, Trophy Brewing, Fullsteam Brewing, New Belgium Brewing, Mystery Brewing, and Natty Greene’s Brewing will be providing a keg of their best low alcohol beer! The races conclude with the Capital RunWalk “Men’s Sub 4 Challenge,” where the field will be set up for a sub 4:00 attempt. Sandy Roberts will look to improve on his personal best time of 4:01.24. He’ll be joined by a great field, that will be announced one by one over the coming weeks. The first challenger announced is last year’s surprise 4th place finisher at the USATF Outdoor Championships, Matt Elliott. Elliot was recently dubbed the “Fastest Kindergarten Teacher in America” and was on the cover of the June 2014 issue of Running Times. The event will also be an official “Bring Back the Mile” Featured Event. To make the event as great as possible they are in need of donations. They have setup a donation page using kickstarter.com. Please donate if you can. I slept better Saturday night in Boston than I did my first night there. My Dad and I had a good complimentary breakfast at the Ramada Boston before heading out for some more sightseeing. We wanted to do the Fenway Park tour but we wouldn't have been able to get there in time by taking the T or a cab. I'm a Braves fan but I also like the Red Sox and hate the Yankees. I want to do the ballpark tour and see a game the next time I am there. We decided to go the Prudential Center in Boston's Back Bay neighborhood. There are 75 stores and restaurants to go along with 2.6 million square feet of office space. My Dad and I headed up to the Skywalk Observatory for some of the best sightseeing in Boston. It is Boston's only sky-high vantage point for sweeping 360 degree views of Boston. They have an acoustiguide audio tour you carry around that gives interesting facts, explanations, and a history of the historical and cultural interest sites visible from the tour. You get a great view of Fenway Park, Boston Museum of Fine Arts, Boston's Back Bay neighborhood, the Boston Marathon finish line, the Zakim/Bunker Hill bridge, MIT, the Charles River, and the Longfellow Bridge just to name a few sites. They also have some good exhibits too. I recommend doing the Skywalk Observatory because you can learn a lot about Boston and have some amazing views. We ate lunch at in the Prudential Center before leaving on our next adventure. We took the silver line to the New England Aquarium and started walking parts of the Boston Freedom Trail. The Freedom trail is a 2.5 mile red-brick walking trail that leads you by sixteen nationally significant historic sites. Our first stop was the Old North Church, also known as Christ Church. It's the oldest standing church in Boston and my Dad sat in the saw pew as former US President Theodore Roosevelt sat in on December 29, 1912. The Old North Church is where Paul Revere met up with Robert Newman to tell him how many lanterns to hang from the 191 foot steeple to signal how British troops were advancing. Newman and Sons of Liberty Capt. Pulling climbed the eight stories to hang two lanterns to signal the people of Boston, Charlestown in particular, that the British were advancing by boat across the Charles River. Our next stop on the freedom trail was Paul Revere's house. The tour of the house is only $3.50 per person but they do not allow photography inside the home. The house dates back to 1680 and it is downtown Boston's oldest building in existence. Revere shared the home with his wife and between five and nine of his children. He had 16 total children, eight with his first wife and eight with his second wife. The Boston Freedom trail is a free tour and some sites on the tour are free, such as the Old North Church. The Freedom Tour is easy to follow because you just follow the red-bricks and red line painted on the sidewalks and roads all over Boston. My favorite period in US History is colonial and revolutionary; so I naturally love Boston because it was the center of the colonies during that period. I debated running the Boston Marathon ever since the Boston Athletic Association sent out the deferment option in their email. The heat was going to be bad, the hottest ever for the race. After talking with many friends, family, and my girlfriend I ended up deciding to run the race. My girlfriend, Jamie, reassured me I could handle the weather conditions and still run well and finish higher than I did last year. I didn't want to waste the eighteen weeks of training that put me in the best shape of my life. I also didn't want to look back on the race wondering "what if". I wouldn't deserve to wear the Boston Marathon jacket or the shirts I had bought if I didn't run the race. Not only was I going to run the race but I was going to run it to the best of my abilities. I thought about running the race with my digital camera and taking pictures and video along the way but opted not to do that. My friend Tim Hawkins was a big reason why I decided to just go for it. He gave me a great pep talk full of motivation. My goal was to get the race over with as fast and as safely as possible. I am currently training for my fourth marathon. I will be running the 116th Boston Marathon on April 16, 2012. I ran Boston last year and finished with a new personal record of 2:54:26. My experience from last year will undoubtedly help me this year. I thought about doing a different spring marathon but Boston is too hard to pass up. The atmosphere and the crowd support is amazing. In the past I've made up my own training plan based on what worked an didn't work for me while also taking input from some friends that are faster marathon runners. This year I am following a plan that several friends have used to drop minutes off their personal records. I just finished week 9 of the Pete Pfitzinger 18 weeks, 55-70 miles a week plan from his book Advanced Marathoning. I thought about doing the 18/70-85 plan but I think the 55-70 will be enough. I am doing some workouts from the 70-85 plan and will peak closer to 80. My goal is to run a 2:50-2:52 marathon in Boston in April. I loved the weather last year and hope it's like that again or even a little bit colder. I thought slowing down enough to do the recovery runs at the pace the plan calls for would be the hardest part but they're not. Recovery runs are at least 2:00 min per mile slower than half marathon pace so mine are around 8:10. The hard part of the plan has been the medium long runs on Wednesday and sometimes Friday during the week. Medium long runs are 10-15 miles. The only hard part is finding different places to run so I don't get bored running in the same places. The Pfitzinger plan stresses Lactate Threshold/tempo runs and marathon pace miles at the end of long runs. I've always done tempos and I like them. Tempos are done at current half marathon race pace after warming up for 2-3 miles and then cooling down for 2-3 after. I do as many as I can on courses with rolling hills to simulate Boston. I've done marathon pace miles in the past but never as many as this plan calls for so that should be a big help. You can't expect your body to run a certain pace on race day for 26.2 miles unless you have ran a lot of miles at that pace during training. I had a great long run this morning with the final 12 at goal marathon pace in brutal conditions; 23 degrees at the start and a wind chill of 11 degrees. I was able to do most of them faster than goal pace but the hills weren't as tough as the ones in Newton. William B. Umstead State Park I am liking the plan so far. I ran 265.4 miles in January, more than I ran in January last year. I've already done one 20 mile run and a 22. I've also done close to 19 in William B. Umstead State Park in Raleigh, NC. Umstead is a great place to train and I love it there. The hills are really tough but they prepare you for anything. The hills in Umstead along with the high rise bridge going from Morehead City to Atlantic Beach, NC got me ready for the Newton Hills in Boston last year. This plan is hard but I believe I will improve just like my friends have by using the Pfitzinger plans.